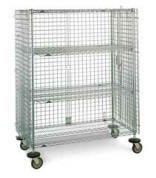 ·Add/Remove-A-Shelf Features: Allows the unit to quickly adapt to your changing storage needs. ·Shelves can be adjusted easily in seconds. 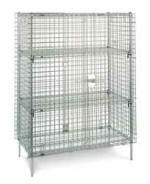 ·Each unit requires a standard Super Erecta shelf at the top and bottom. Standard Duty Stem Caster Models: Features 5" swivel casters. Please note model numbers for specific caster types. Features aluminum dollies with wraparound bumpers and 5" diameter casters.